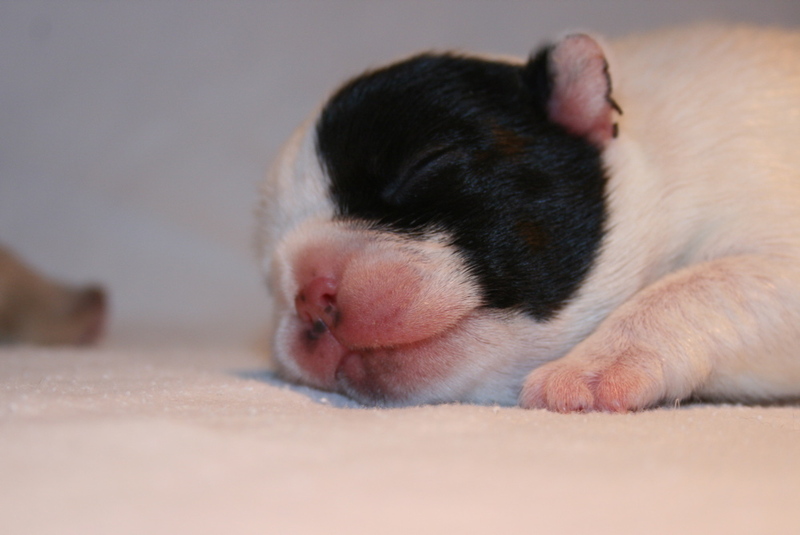 https://i0.wp.com/www.bullmarketfrogs.com/wp-content/uploads/2015/04/Brindle_pied_frenchbulldog.jpg?fit=662%2C662 662 662 Carol http://www.bullmarketfrogs.com/wp-content/uploads/2015/06/bullmarket-logo.png Carol2010-03-06 22:18:092010-03-06 22:18:09Happy Birthday Dear Puppies! All the boys are doing well – Striker, the tiny pied boy, is gaining as much weight per day as the two beefy boys, and the fawn boy (nicknamed Sidney) is also doing well. Turns out his ‘gaping umbilical’ was really more of a ‘nicely healing umbilical’. Mea culpa when it comes to being overly protective. Tula just wants us to stop fussing with her kids, and leave her to get on with motherhood. Happy to oblige, Tula. When does the ‘fun’ part begin? 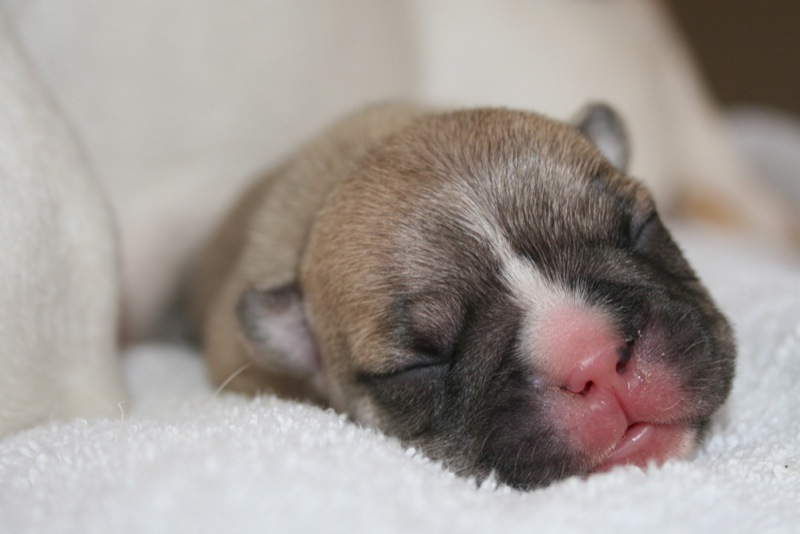 Tula's Black masked fawn French Bulldog puppy needs some veterinary care. I have to take Tula’s little fawn boy to the vet after work today – seems that his umbilical isn’t healing. More accurately, instead of being a little pin point on his belly, it’s big gaping hole. I have seen this once before in a puppy, and it was easily treated – the vet put in a couple of dissolving stitches, and it was fine. Let’s hope that’s all it needs to fix him, as well. Paula’s little guy is still not doing well. He has foamy diarrhea, and I just can’t seem to get weight on him. He was up 19 grams this morning, and now he’s back down to yesterday’s weight. We’ve got him nursing every two hours, so I’m not sure what else to try. I’m rarely stumped by a puppy, but he’s stumping me. He nurses til his tummy is full, he isn’t dehydrated, and other than the diarrhea, I don’t know why he’s not gaining. I tried to give him some probiotic powder (fortiflora) for the diarrhea, putting a few granules on his tongue, but he vomited up all his milk, so I won’t be trying THAT again. Paula is going to bring him some flagyl, and if that doesn’t help by tomorrow, he’s off to the vet as well. I’ve been running on two to three hours sleep a night, up every two to three to make sure the puppies are on nursing, and to give the tiny guy some extra attention. While I’m at work today, Sean is home running in and out checking pups, putting the pen back together (Tula is a digger, and has been burying the pups under the blankets), checking for full tummies and clean bottoms, and doing piles of laundry. This afternoon I’ll drive home, meet Sean at the door, take the Fawn boy in to the vet and get back home again just in time to start my night shift on puppy watch. Thank God Sean has four days off of work between shifts, or I’d have to take the entire week off of work. 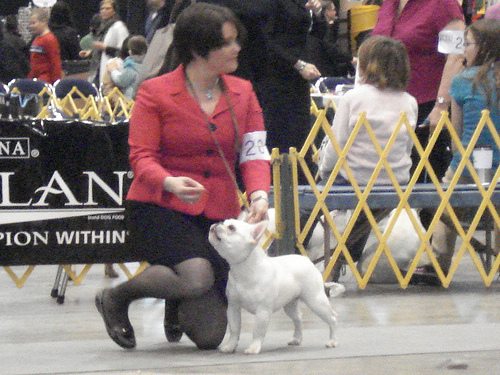 I keep getting emails from people telling me that they’re going to breed their French Bulldog once, “just for fun” – but could someone tell me when the ‘fun’ part of dog breeding is supposed to kick in? Photos from yesterday below, or on Flickr. 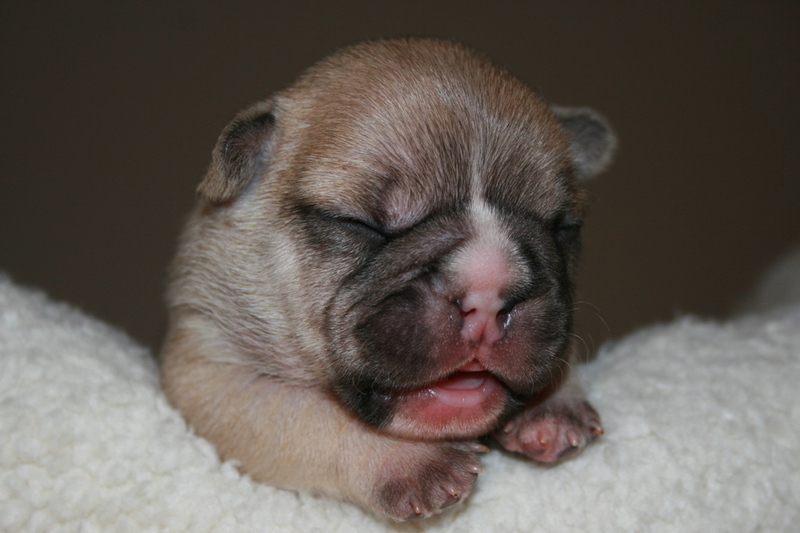 https://i0.wp.com/www.bullmarketfrogs.com/wp-content/uploads/2015/04/Brindle_pied_frenchbulldog.jpg?fit=662%2C662 662 662 Carol http://www.bullmarketfrogs.com/wp-content/uploads/2015/06/bullmarket-logo.png Carol2010-03-01 12:08:182010-03-01 12:08:18When does the 'fun' part begin?